Add oatmeal, banana, vanilla extract, cinnamon and salt. Cook, stirring occasionally, until mixture reaches desired consistency (about 5 minutes). 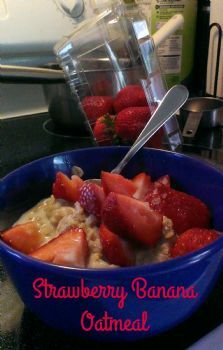 Note: I have made this with fresh strawberries, but it would also be good with roasted or frozen strawberries. YUUUMMMYEEE! Look at those strawberries, so RED! Yum! Looks delicious! I love oatmeal. Sounds delicious! I'm going to have to try this soon!